The figure below shows all U.S. states ranked by ITEP’s tax inequality index. A state falling below zero means that incomes are less equal after state and local taxes. The farther below zero a state falls, the more regressive their tax code is. As you can see, Pennsylvania, which has a flat income tax rate due to our constitution’s uniformity clause, has the 7th most unfair tax system in the United States. 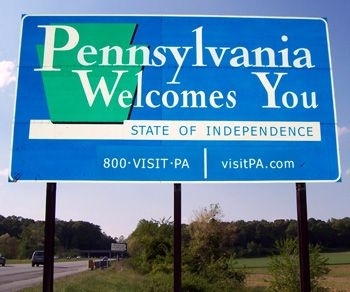 Pennsylvania is only one of nine states that has a flat personal income tax. Other states with a personal income tax use a graduated system where the tax rate increases with higher incomes. Flat personal income tax rates result in a more regressive tax structure because it requires higher payments from low- and middle-income families. A graduated system can collect more revenues from high income taxpayers and allow for a lower tax bill for those who have low or middle incomes. As the chart below shows, states with a graduated personal income tax rate are more progressive—the more you are able to pay, the greater percentage of your income goes to taxes. In Pennsylvania, the impact of our tax structure is a regressive tax system where the poorest members of our state are paying the greatest share of their income on state and local taxes. The bottom 20% of income earners pays 13.8% of their income on state and local taxes, while the super-rich pay just 6% of their income on these taxes. Pennsylvania’s tax structure creates a variety of problems in the state. Our tax system is structured in such a way that existing inequalities are actually worsened after state and local taxes are taken out. While not the cause of inequality, our regressive tax system exacerbates existing income gaps. Nationally, low-income families (bottom 20%) see their income fall by 2.8% after state and local taxes are applied. Meanwhile, the top 1% of income earners see their income rise by 1.6% after state and local taxes. Current state tax systems are actually playing a part in helping the rich get richer and the poor get poorer. Regressive state tax codes like Pennsylvania’s also result in higher tax rates on communities of color, who are more represented in the low-, moderate- and middle-income quintiles. So, not only do regressive tax systems result in widening income inequality, they also worsen the racial wealth gap. And finally, regressive tax systems have an impact on the amount of revenue states are able to raise. Relying too heavily on low- and middle-income families to generate much-needed state revenue makes little sense, especially as wages in these income brackets have remained stagnant. However, because the income of the rich and super-rich has grown rapidly, taxing them at lower rates has resulted in declining and inadequate state revenue. Couple that with our declining corporate taxes and Pennsylvania is in a revenue crisis. No wonder we have a problem funding our schools, keeping our infrastructure up-to-date, and providing much-needed services to those most in need.